The Rubik's Cube was the first puzzle in my collection. 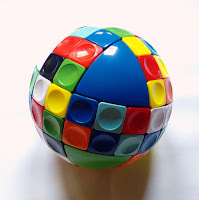 Ever since, I collected an assortment of puzzles with different shapes, sizes and colors. Once you start realizing how many different puzzles are there, you'll certainly feel overwhelmed and spoiled for choice. Over the years, I developed a preference for sliding puzzles, but never forgot which type of puzzle got it all started. 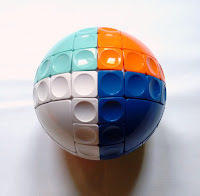 So, it's not difficult to understand why I was so excited when I first heard about the V-Sphere, a combination of Rubik-like solving with a 3D sliding mechanism. It's the perfect combination. Now, all that was needed to prove was if the mechanism was good enough to provide a pleasurable and satisfactory experience, which many puzzles fail to deliver. Fortunately enough, I had nothing to fear. The V-Sphere is manufactured by one of the most respectable and dedicated companies that produce twisty puzzles, the V-Cube by Verdes Innovations. Their flagship V-Cubes are some of the most appreciated and high quality twisty puzzles you can find, and so, the V-Sphere is not any different. The puzzle was invented by Greek designer George Chronopoulos. 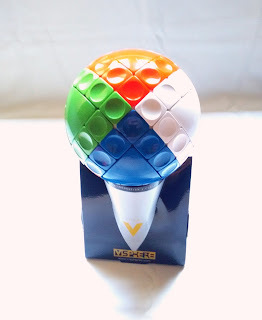 So, what is the V-Sphere anyway? 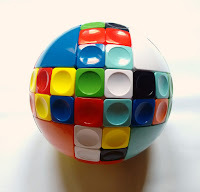 The V-Sphere is an intimidating puzzle with 8 spherical triangles fixed to the internal frame and six rows of tiles that cross the entire perimeter of the sphere. Each triangle has a different color and is surrounded by 12 moveable tiles, except for one triangle (blue), where it has only 11 tiles surrounding it. I would've preferred to have another color with the missing piece, like the white one for example, since I like the blue color most, but it's just a minor annoyance. The missing piece is so that there is space to move the tiles around to mix and solve the puzzle. Since the blue triangle is the one with one piece missing, you should leave it for last, as it will be solved automatically when you solve all the other seven triangles. The V-Sphere is hard to categorize in terms of difficulty. It will depend much on your skill level. If you've been solving twisty puzzles for a while, especially the higher difficulty ones, like the V-Cube 4 and upwards, then this should be a walk in the park. If you struggle to solve a 3x3x3 cube, then this will definitely be an interesting challenge, to say the least. 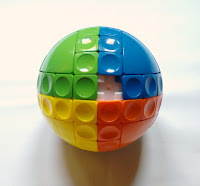 Don't despair though, because I still think the V-Sphere is a little easier to solve than a 3x3x3 cube. Patience and persistence will, in the end, be rewarded. The V-Sphere is a superb puzzle, even if it's just to mix and play without worrying about solving it. It's a great stress reliever, and most importantly a great exercise for your brain. It is among my favorite 3D sliding puzzles, and that's saying a lot. I would definitely recommend it to anyone with an interest in puzzles, albeit a bit difficult for newcomers. Availability: You can find the V-Sphere at JWS Europe.